Challenge to The Shoreline Soup Kitchen & Pantries. 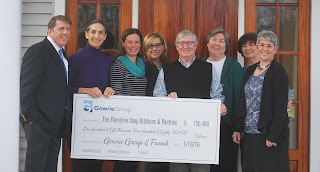 Every year between Thanksgiving and New Years, Carter Gowrie, CEO of Gowrie Group, reaches out to the community to help raise funds to feed the hungry through the Gowrie Challenge. The campaign, now in its 13th year, found its inspiration years ago when Carter volunteered for The Shoreline Soup Kitchens & Pantries (SSKP) alongside his five children when they were teenagers. That desire to give back to the community in a meaningful way has only grown, resulting in a matching gift campaign that in 12 years has raised over 1 million dollars ($1,000,000) for SSKP. Since 1989 SSKP has provided food and fellowship to neighbors in need who reside in Chester, Clinton, Deep River, East Lyme, Essex, Killingworth, Lyme, Madison, Old Lyme, Old Saybrook, and Westbrook. Last year they served over 8,000 residents, providing enough food for over 1 million meals. In 2016 the need has continued to rise, with the number of meals distributed increasing by 7% so far this year. – are providing an additional $23,000 in matching funds. Gowrie Group is once again challenging the community of local businesses and friends to help them meet and exceed an ambitious goal - raising $125,000. The 2016 Gowrie Group Challenge runs from November 15th to December 31st. 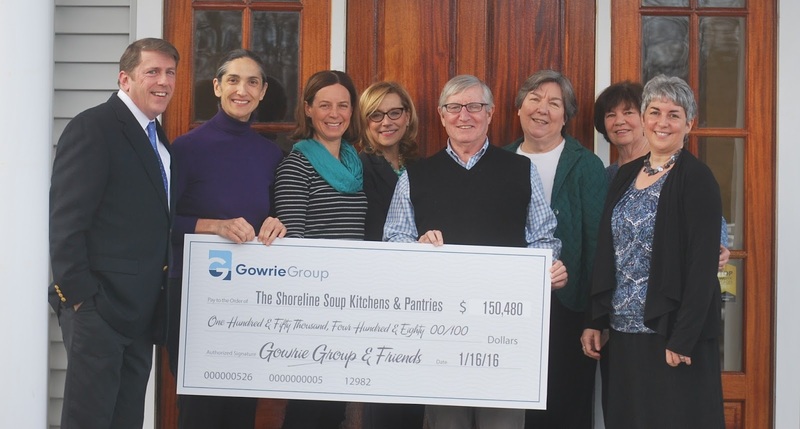 Throughout the year, Gowrie Group and its employees donate time and services to soup kitchens and pantries across New England. Each summer, Gowrie employees prepare and serve a lunch at an SSKP meal site in Old Saybrook, CT. Before the holidays, Gowrie employees host canned food drives at each office location – Westbrook CT, Darien CT, Newport RI, Marshfield MA, Annapolis MD, Boston MA, and Manchester NH – and donate the collected goods to local entities. Employees and their families also volunteer regularly at a variety of food pantries and meal service locations across the region. Donations by mail should be sent to: The Shoreline Soup Kitchens & Pantries, Attn: Gowrie Group Challenge, P.O. Box 804, Essex, Connecticut 06426.